Joseph Gould bought land from Governor Gawler – section 5616y – at One Tree Hill, about1842. He built a home and called it ‘Burrow Hill’. He divided his attention between cattle and dairying. Later he purchased land further down the creek – which is known as Goulds Creek. He didn’t have any sons, but he had three daughters. The eldest daughter married William Kelly (son of Wm Kelly of Cudlee Creek, who arrived in 1838). One sister married Britton-Jones and the other married Percival Gaylard, a gentleman farmer who took over ‘Burrowhill’ and became one of the leading men in the District. William Kelly built the Goulds Creek home on land purchased from Joseph Gould in 1848, after he married Elizabeth Ann Gould on 7-4-1846 at Holy Trinity Church, North Terrace Adelaide. William was of age, being 23, Elizabeth a minor (possibly 20yrs) also on the same day Elizabeth’s younger sister Susan Gould married Briton Tasmania Jones. (Susan was probably 18yrs). The Goulds Creek property grew wheat on the hills, which was reaped with a stripper which had a stick of wood on the top with a weight hung on the uphill side to stop the stripper capsizing! They had Shropshire fat lambs which were sold at the sale yards at the corner of North and West Terrace, where the Newmarket Hotel stands. A double decker trolley was used to transport the stock. They also sold butter wrapped in cheese – cloth. Joseph Gould of Low Hand, Somerset , sailed from London on the 7th June 1839 on the Prince Regent. The barque, of 394 tons, arrived in Adelaide on September 25th 1839. 199 passengers were on board where 23 deaths were registered during the journey. Amongst the listed passengers were, Joseph, Susan , Frances , Elizabeth and Jane Gould. Within 10 days of arrival in the new colony Joseph was located as a tenant on 67 acres of farm leased by the SA Company on Section 233 in the Mitcham area. He is credited with planting very good crops consisting of five acres of what and oats, seven of barley and one of potatoes. He erected two dwelling houses, one of stone and one of wood. Writing home in 1842 he recoded that with the profits he was able to build a comfortable dwelling house. Early South Australian records were often incomplete but from the early South Australian Almanacs, we gain the following information. In 1840, Joseph purchased section 5616, 80 acres of the special survey of the Little Para. In 1841 and 1842, Joseph Gould had substantial holdings at Brownhill Creek where at one stage he shared Barton Farm with William B. Edmonds and Nicholas Foot. They had 109 feet, 64 cattle, and some horses and grew wheat, barley maize and potatoes. His name is first listed as farmer on the Little Para, in the country districts of the 1847 almanac, but he may have settled there are earlier as country listings in the almanac for 1844 – 86 were incomplete. J. Gould is listed on the Little Para in 1844 and this may refer to Joseph Gould. Census returns for 1841 show, Joseph, male under 50, Elizabeth female under 21, Frances , female under 40, Susan female under 14, Jane female under 7. Joseph Gould was the original the original purchaser on sections 5616, 4234, 4227, 4233, 4204-5, 4206-7, and 4197 in the Hundred of Munno Para, following the course of Gould’s Creek. Gould built his home on section 5616 and named it Burrowhill and divided his attention between cattle raising and dairying, enlarging his property as he prospered. It seems likely that the creek was named after Joseph Gould but this may not necessarily be the case, It may have been named after John Gould, the Ornithologist, after whom Mount Gould, (10 km south-east of Gould Creek) was named. Perhaps the property with its stone house and separate stone kitchen building was named Burrowhill because of the many burrows in the area, which were made by Bilbies. When the District of Highercombe boundaries were outlined, the settlers north of the Little Para had no connecting roads to the district. Local land owners, Alexander Kirk Robert Smyth, Joseph Gould and Rueben Richardson raised £318 to construct a road through private property. The road became known as Snake Gully road and was opened May 10th 1859. Alth ough Snake Gully road was in constant use it was still hazardous to cross the Little Para. In 1871 a grant for £1,000 from the South Australian Government was sought and received for the construction of a bridge. The bridge opened May 3rd 1871. The bridge has a substantial and almost a handsome appearance. It is made completely of stone and has a span of 24 feet, the width of the roadway between the parapets being 20 feet 4 inches. It has Scotch coping, parapets and wings, end the arch, which is of freestone, is 21 feet above the stream. There are embanked approaches on both sides. The stone used in the work was obtained in the immediate neighbour hood, and the lime was made from Mount Torrens marble, obtained from the property of Mr. Turner. The bridge was erected out of a vote of £1,000, which was derived from the sale of Treasury bills. The foundation-stone was had in May, 1873, by Miss McEwin, a daughter of Mr. K. McEwin, who is an old and much-respected settler in the neighbourhood. It was appropriately arranged that the opening ceremony should be performed by Miss Gaylard, the daughter of another gentleman who has during his long residence in the district won much respect, and a large crowd of people assembled to celebrate the affair. Indeed, it was a matter for wonder where everybody came from, for there must have been several hundred persons present. At about a quarter to 2 o’clock a procession was formed at the southern end of the bridge. Miss Gaylard was introduced to the assemblage by Mr. Ward, M.P., and, having broken a bottle of wine on the causeway, declared the bridge to be open for public traffic. The people then passed over, and the career of the Snake Gully Bridge was thus successfully inaugurated. Luncheon was provided in a marquee on the ground, and was catered for by Mr. J. Butler, of the Modbury Hotel. The tent was decorated with the inscriptions—’ Welcome to Snake Gully’ and ‘ Advance Australia .’ Mr. Percival Gaylard (Chairman of tho Teatree Gully District Council) occupied the chair, and Mr. Joseph Daw (a member of the same body) acted as Vice-Chairman. The work, which would be an everlasting boon to the district, had been initiated by Mr. Gaylard, and Mr. Ward, with Mr. Cavanaugh, had been the great means of getting it carried, out. If any member deserved their thanks it was Mr. Ward, who had done great things for tho district Mr. P. Gaylard, in responding, said he had done nothing more than his duty in working for the district in which he had the honour to reside. He should have liked to have been there that day Mr. Playford, who in his last dying speech and confession at the Road Board— for he did not believe he would be returned again said tho bridge was a waste of money, and was being built for two men only. The Gould Creek Homestead was originally built not long after 1844. A second storey followed when the property was passed onto William Kelly who married Gould’s eldest daughter, Elizabeth. Elizabeth inherited half of Joseph’s property. The Gould’s Creek property grew wheat on the hills. The steep hillside was reaped with a stripper, which had a stick of wood on the top with a weight hung on the uphill side to stop the stripper capsizing! The property also raised Shropshire fat lambs, which were sold at the sale yards at the corner of North and West Terrace, where the Newmarket Hotel stands. The hand-fashioned natural stonework of the gracious two-storey home was framed by an intricate white wooden balcony, which extended across the front and along the western side. On the eastern side of the house stood the separate kitchen built of stone and alongside it the old vine-covered wine cellars, which were later used as a garage. At the back and on the western side of the house was a mature garden of many shrubs and old orange trees, which extended down to the banks of Gould Creek. Right alongside the creek was a very old stone stable with a hay loft above and a very old water pump alongside. To the north of the stables was a large traditional iron shearing shed and horse dressage area. The whole homestead was in a very deep valley with extremely steep hills enclosing it on all sides. The creek, which ran through it, was studded with huge red gums and willows. Trout could be found in the creek, which never completely dried out. Another large property in the area is known as Yelki. It is linked to Gould’s Creek Estate through the marriage of William Kelly and Joseph Gould’s daughter, Elizabeth. Part of Yelki once belonged to Gould’s Creek homestead and was sold to the son of William Kelly, Edward Arthur Kelly in 1891. The property passed on to his son, Harvey William Kelly in 1922 and then on to W.A. (Bill) Kelly. Yelki homestead borders on Gould’s Creek homestead property to the north-west and at one time encompassed present day Craigmore. All of Joseph’s daughters married, a double wedding was held for two of the daughters. MARRIED. On Tuesday the 7th instant, at Trinity Church , by the Rev. James Farrell, Colonial Chaplain. Mr Wm. Kelly, of the Para, to Elizabeth Ann, eldest daughter and Mr Britten Jones, of Launceston, Van Demon’s Land, to Susan, second daughter—of Mr Joseph Gould, of Longbottom Farm, on the Para . The youngest daughter, Jane, married Percival Gaylard, an English gentleman farmer who later took over Burrowhill and became one of the leading men in the district. He is credited with being a good farmer and raised fine horses and cattle. Joseph died aged 65 on the 25th February 1870, after a long illness, at his home Joy villa at Nailsworth. His obituary appears in the Observer with an identical report in the Register on Wednesday March 2nd, 1870 page 5. The late Mr Joseph Gould – after a long illness, Mr Joseph Gould of ‘Joy Villa’, Nailsworth, formerly of Low Hand, Somersetshire, died on February 25th. His remains were buried at Gould’s Creek, where the Reverend M.C Wilson conducted the service. A large number in mourning coaches and other vehicles, as well as on horseback, followed in the procession, as a last mark of respect. Mr Gould was an old colonist, having arrived in South Australia about 32 years ago. He showed in his career practical common sense, and by shrewd business habits, and industrious application to farming pursuits had acquired considerable property, an in the early years he assisted in opening some of our finest agricultural and pastoral country. The lands of his son in laws, Messes P. Gaylard, W Kelly, and B.T Jones, are like his own, brought up to a high state of cultivation and well repay visitors who inspect him. 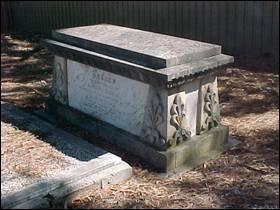 Joseph is buried in the One Tree Hill cemetery, in a family vault that also holds his wife Frances, his daughter and son in law, and several grandchildren. And ease me of my pain. Elizabeth Anne Kelly wife of the above who died October 9th, 1924 aged 98 years. In loving memory of William Kelly died April 21st 1915 aged 67 years. Fanny Sarah, wife of the above died July 1948 aged 97 years. Ester Fanny Kelly died 7th September 1949. 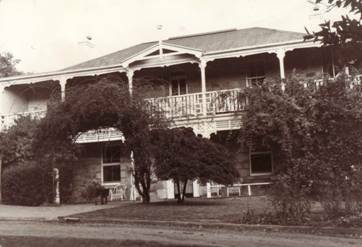 Regretfully the property was compulsorily acquired by the E. & W. S. in 1977, and the then owners Bill and Rosemary Harvey, the fourth generation of the same family to have lived in Gould’s Creek Homestead were forced to leave. 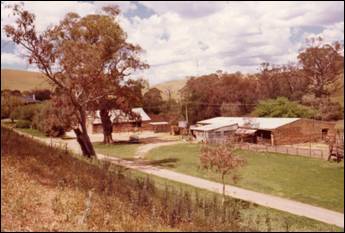 The homestead, outbuildings and 500 year old gum trees were razed to the ground to make way for the Little Para Reservoir. Children of William Kelly and Elizabeth nee Gould. Register on Wednesday March 2nd, 1870 page 5.